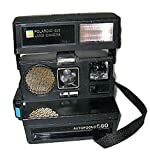 The Polaroid Autofocus 660 was a square-bodied immediate electronic camera in Polaroid's 600-series. It was the very first in the array to use Polaroid's patented Sonar Autofocus tool. The range to the topic was computed by emitting a sonar (ultrasonic) pulse which then was caught once again. The time distinction between the sent versus obtained pulse gave the distance dimension. The sonar emmiter/receiver is the huge gold disk alongside the lens.